Yes, there are thousands and thousands of sites across the globe where professionals strive daily to clean cars at the height of their abilities. So, when a carwash business does win an award, particularly a young business, it definitely piques interest around here. 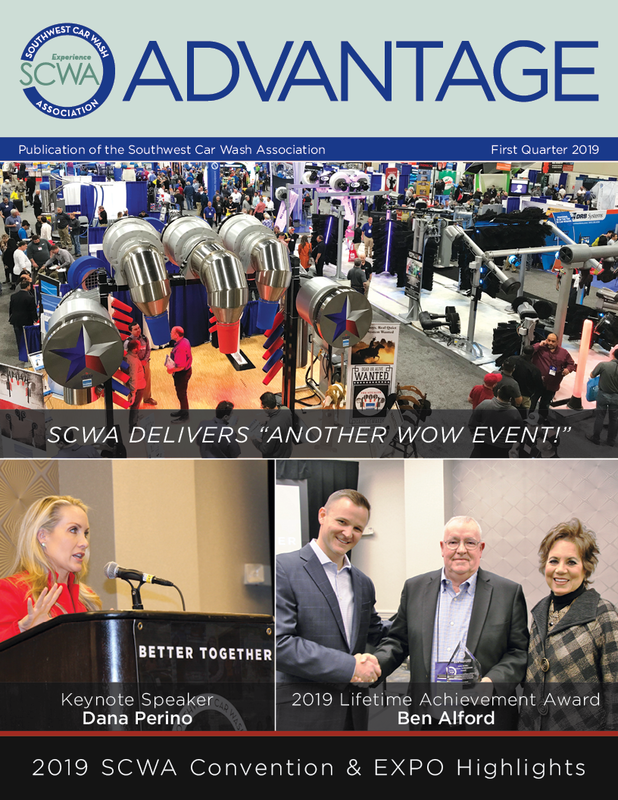 Early in 2012, Clean Getaway Car Wash & Detail Center in Mansfield, TX, was awarded “The Conveyor Car Wash of the Year” for 2012 during the Southwest Car Wash Association’s Convention and EXPO. PC&D contacted Owners John Huffman and Sophie Radde and Manager Kevin Bledsoe to learn more about their flex-serve operation. The Clean Getaway team revealed that the wash was nominated for the award by Jerry Vickers of Blendco Systems. Vickers visited the wash to work on the business’s chemicals, and he was impressed with the equipment, layout, customer service and even the free sodas that the wash offered customers. Vickers noticed the wash employees always had smiles on their faces, said “thank you” and “have a nice day” and opened doors for customers when they got in and out of their cars. Even though the award was titled “Conveyor,” Clean Getaway’s manager and owners believe the wash received the award for a number of business components, not just a superior tunnel. As a flex-serve carwash, Clean Getaway offers a broad variety of menu options, so there is a competitive cleaning option for just about every type of customer. Whether a customer is looking for a quick exterior wash with free vacuums or a complete interior/exterior detail with paint restoration services, the wash has a package that fits the bill. The owners feel this variety appeals to a larger audience than traditional full-service washes or newer express washes. When it comes to clearly communicating all the different menu selections, the most valuable tool is actually the wash’s employees. While there are menu signs in several places around the facility, they can be a bit overwhelming for a customer that is not familiar with the wash. Thus, Clean Getaway decided that the best way to educate the customer is the ticket writer or greeter. This employee speaks to every customer and, as quickly as possible, offers a cleaning solution that ensures customer satisfaction at a competitive price. the normal levels of service, whether it is the basic $5 wash or the most expensive package on the menu. In this environment of consistent customer service, Clean Getaway is expecting a lot from its employees. The owners and management said one of the most important expectations is that new employees be cross trained in all areas of the business as quickly as possible. This ensures that the wash has the flexibility to move employees around as staffing needs change throughout the day. work, management can call on any of the staff instead of being limited to a select few with the right experience.“Without good employees, we are not able to provide the level of service we strive to deliver,” Bledsoe explained. Employee turnover and constant training are two problems that many carwashes struggle with today. At Clean Getaway, the owners strive to pay competitive wages, and management tries to make the employees feel like they are part of a team, not just a way for the wash to make money. rain.” Not every carwash employer offers this, but Clean Getaway chooses to because the employees want to work but cannot due to the weather. What about the wash ? Clean Getaway was built with some unique technology inside the actual tunnel. First, the wash uses foam brush equipment. According to the owners, this type of cleaning material was selected because dirt and other contaminates are not as likely to adhere to the foam equipment as they would be to cloth. And, if the washing equipment stays clean, the cars will come out cleaner. Other boons inside the carwash have been the automated wheel cleaner and the tire shiner, the owners said. In the tunnel, these machines do an exceptional job of cleaning the wheels then dressing the tires. These services have proven especially popular with customers because they work quickly and offer good results. Although all of the equipment in the tunnel is automated, managers and employees were originally hand mixing all of the soap Clean Getaway used in the pre-rinse or “prep” area. Now, the business has added an automated mixing station to that section. According to management, this new station cut the wash’s soap usage substantially in its first month of use. 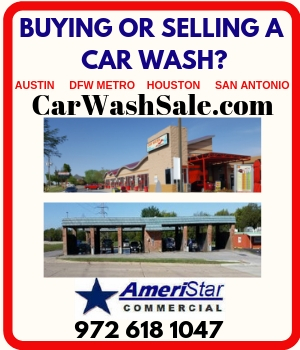 Outside, the carwash is a result of compromise between the ownership team and the city of Mansfield. In fact, the developer had to come up with an overall building design and layout that met both the requirements of the city as well as the requirements of the owners. The hope was to develop the site so that Clean Getaway looked like a carwash to customers, flowed like a carwash, yet still conformed to the city’s architectural requirements. Though it took a lot of compromising on both sides, the ownership team could not be happier with the final product. In the development stages, Clean Getaway’s owners were looking for a strong neighborhood with good demographics and zoning. In 2009, CNN’s Money magazine rated Mansfield as one of the “Best Places to Live” in the U.S. and ranked the city 24 out of the top 100 places. The growing city is a place where people with “new money” are moving, and it is located near the major city of Arlington. Arlington is the home to the Dallas Cowboys, the Texas Rangers and a General Motors plant. Huffman, Radde and the rest of the ownership team saw there were no flex washes in Mansfield when they chose the location— there were only express or full-service washes. Still, acknowledging that there are plenty of competitors in their market, the management team described how Clean Getaway differentiates itself from the other washes in the area. First, employees and managers strive to be consistent in their service and provide the customer a good value for the money spent. Unlike their express wash competitors, Clean Getaway offers a complimentary towel dry on all washes. The towel dry provides a huge value for the customer and makes a big difference on the finished product. Clean Getaway also built a “beautiful facility,” and the staff works hard to keep it clean at all times. The owners know that the wash’s cleanliness is a reflection of the quality of work performed on customer vehicles. Finally, a free soda machine in the carwash lobby has proven to be a big hit with customers, too. At the time of development, late 2008 to 2009, due to the shape of the economy, banks were very critical with lending requirements, Radde noted. In fact, it took the team over a year to secure financing from a bank. Luckily, Huffman and Radde had a thorough business plan in place. The plan was not built on making the most profit per car; instead the owners wanted customers to know that a car would come out clean even after a basic wash. This plan paid off with happy customers … customers who recommended Clean Getaway as the carwash to go to in the area. Radde said this early word of mouth gave the business a great reputation as soon as it opened.